A long-running Adelaide marketing and document processing company has been placed under voluntary administration after it lost an SA Health contract to an interstate company. ABF Solutions, established in 1988 and otherwise known as Adelaide Business Forms, provided brokerage services, produced state and federal election and political marketing materials – including once for Labor MP Tom Koutsantonis – and processed documents, including for SA Health. Director John Bradmore placed the company into voluntary administration last week after losing a contract with SA Health, which it had held for almost a decade, for the processing of SA Pathology request forms. Update: SA Health has denied that it had an ongoing contract with ABF, but that said it commissioned the company on an ad hoc basis. ABF Solutions operated in the CBD on Sturt Street for most of its life before moving to Morphett Street about four years ago. Bradmore said the contract – worth about $125,000 and which the company acquired about nine years ago – was put out to tender for the first time this year, and won by a Perth company. He said the contract had kept the business viable until now. Bradmore said his plan had been to sell the company in a couple of years but that the loss of the contract meant he had no choice but hand it over to administrators last week. “It’s not the way you want to end 30 years of business, but when you can’t do anything about it, that’s what happens,” he told InDaily this morning. Bradmore said ABF Solutions had employed about 30 workers at its peak, but that it had steadily declined, along with the printing industry. It was placed under administration with only “a couple” of employees on the books. “The printing industry hadn’t been growing for years,” he said. Bradmore said his business originally came into the contract eight or nine years ago because another company, More Business Systems, folded. “They closed down and we ended up with it,” he said, adding that the handover of a contract was a complicated story, on which he declined to elaborate. Despite the impact the loss of the contract had had, Bradmore told InDaily SA Health was within its rights to put it out to tender. “The business collapsed because we (lost) a government contract,” he said. SA Health says there has been no change in its tendering policy over the last 12 months and that ABF was commissioned occasionally, rather than on an ongoing contract. A spokesperson for the department told InDaily this afternoon that all procurement activity undertaken by SA Health “is in line with State Procurement Board guidelines and delivers value for the taxpayer dollar”. “There is no SA-based company that can provide the full printing service requirement SA Pathology requires,” the spokesperson in a statement. According to its website, ABF Solutions – whose motto is “Outrageously Versatile” – also produced video business cards and brochures, wine boxes with video screens under the lid, catalogues, brochures and leaflets. 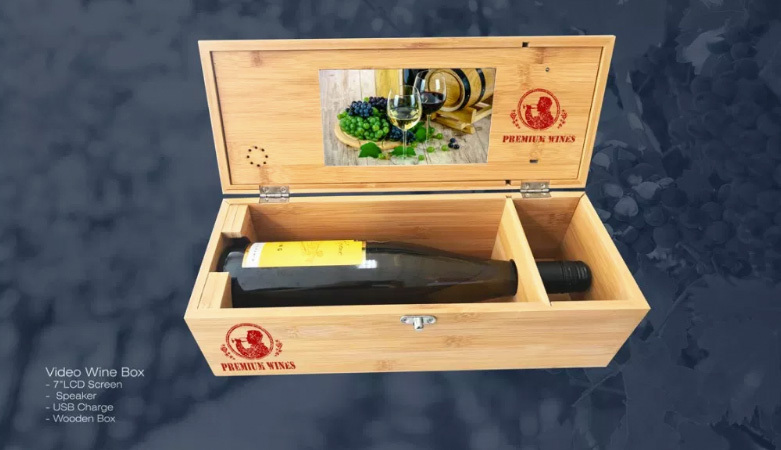 A video wine box advertised on ABF Solutions’ website. Bradmore added that although his company was in the process of being liquidated, there was still a chance that a “white knight” investor may come in and buy it. InDaily contacted SA Health and liquidation firm Clifton Hall for comment this morning. Koutsantonis confirmed his office had used ABF Solutions’ services in 2016.